Caroline Sherman was wandering around a government trade fair in Sydney in 2014 when she was struck by a flash of amazing colour and pattern. A textile designer by trade, Sherman, who studied and worked in the UK fashion industry, had always been passionate about design, but what she saw that day struck a resonant chord. On arriving in the area, Sherman says she discovered that the primary form of income for local women is sales generated from Bilum bags – intricately crafted vessels that carry much more than their immediately contents. Woven from wool or natural fibres, the process of crafting a Bilum bag is a threefold one: first, fibre is sourced from local trees; it is then dyed using pigments created using berries, amongst other natural ingredients; finally, the weaver twists the yarn to create the fibre, after which time the bag is woven by hand. Owing to the availability of resources and the highly individual nature of the handcraft, each bag tells the story of its creator; designs used in the crafting process are also treated as heirlooms to be passed down between generations of women, who similarly pass the craft on to their daughters. And while they serve an important cultural function, the practicalities of their form allows for any number of functions, from carrying fruit and vegetables, to school books, and even small children. 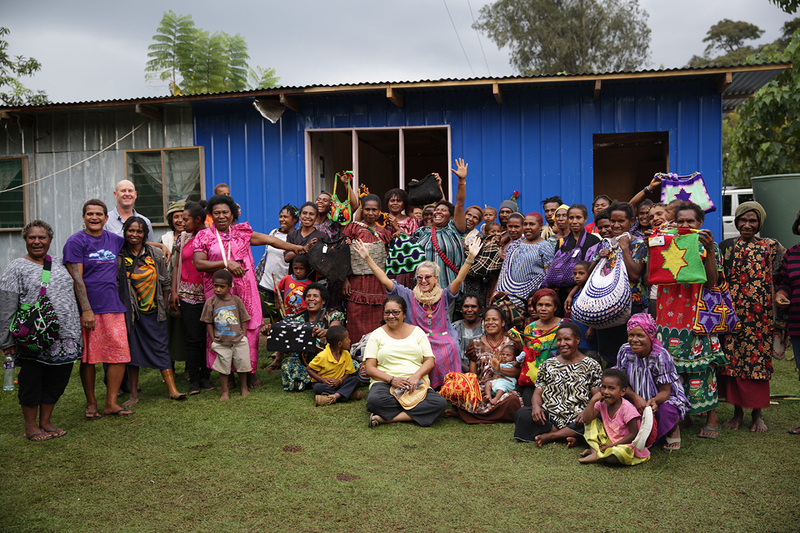 The following year, Sherman launched Among Equals, a social enterprise founded with the hope that engaging directly with these artisans and paying them a premium for their work, the arduous sales process and lack of guarantee around actually making a sale could be eliminated, and thus, some of the hardship affecting the lives of those women and children in the Highlands of Papua New Guinea. Sherman made several return trips with the purpose of educating herself and meeting the weavers with whom she would be collaborating. It was there that she discovered that while the country is rich in resources, it is reliant on foreign investment, and jobs for locals are scarce. It’s common, however, for women to be the main breadwinners. “Without a sustainable market, sales often depend on the whim of a few tourists, and, within the community, on the gifting of bags to each other. My initial idea was to commission my own designs, but the bags lost something that way,” says Sherman. 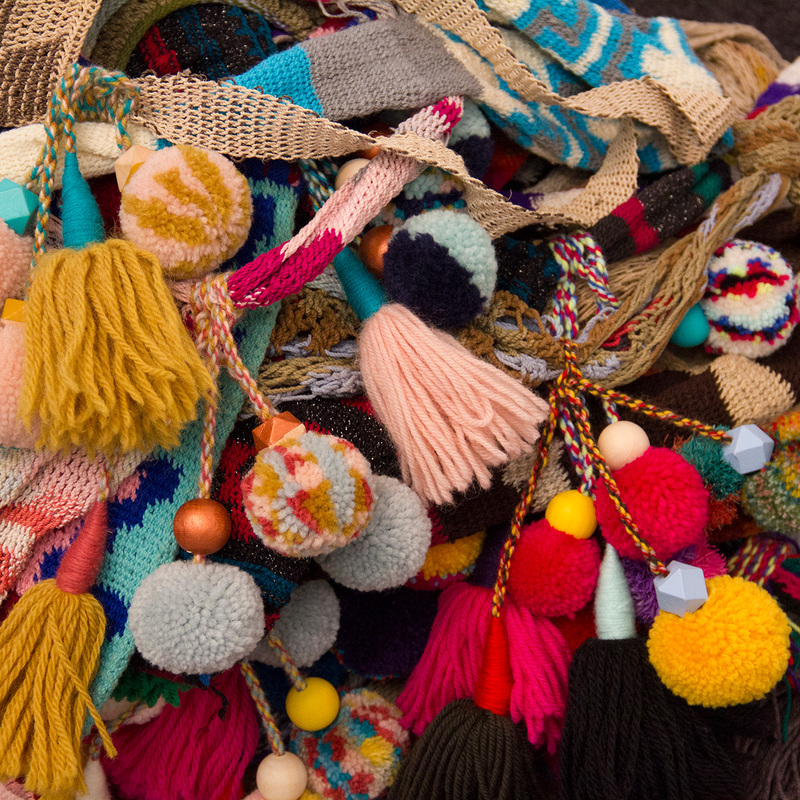 “I quickly realised that each bag is a woman’s story and the designs are a visual language. In September, Kamel visited Australia to attend the opening of Bilum bags from Papua New Guinea, a recently opened exhibition staged by Among Equals that is currently on show at Sydney’s Koskela. Accompanying the exhibition is the premiere of a short documentary film was shot on location in Port Moresby and the Highlands of Papua New Guine on Sherman’s most recent trip in collaboration with the filmmaker Maximilian Homaei. “It is a real opportunity to gain an insight into the daily life of these special women weavers, and how the sale of Bilum bags is directly impacting their lives,” Sherman says of the documentary. “It also highlights the natural beauty of PNG and the strong message that by buying a bag you can transform the lives of these communities.” She adds that she did show the documentary to her partner Emile, who gave what you can imagine would be indispensable feedback from an Oscar winner. It’s Sherman’s hope that he will accompany her on her next trip. Over the course of the next year, Sherman is looking to expand the reach of her program to involve more communities across the region. “At the moment we are working with approximately 100 weavers. My aim is to work with 500 women in five years.” To hear Sherman tell it, it would appear as though she already has this one in the bag. Bilum Bags From Papua New Guinea is exhibiting at Koskela from September 2 until October 1, 2017. You can find out more information here. You can find out more information about among equals here.